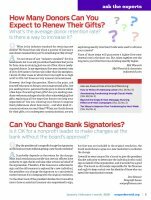 Home > Membership > Nonprofit World > Can You Change Bank Signatories? Can You Change Bank Signatories? Is it OK for a nonprofit leader to make changes at the bank without the board's approval?